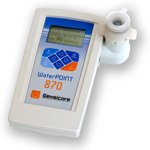 Sensicore added new testing capabilities to its WaterPOINT 870 optical handheld water analysis system. Users now can test for manganese, sulfide, zinc, molybdate, bromine, silica, and chloride, totaling 35 different tests in a single device. The results can be collected, stored, and printed in the field or downloaded onto a PC, making testing fast, efficient, and accurate, with minimal training required.